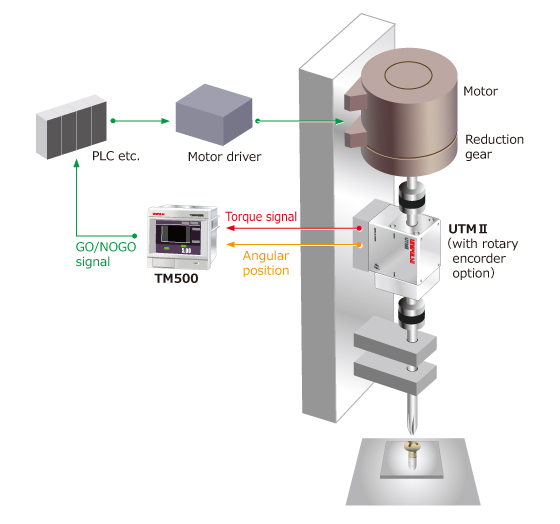 The TM500 is an indicator that can be easily connected to UTMⅡ/UTMV via the attached (supplied) cable. 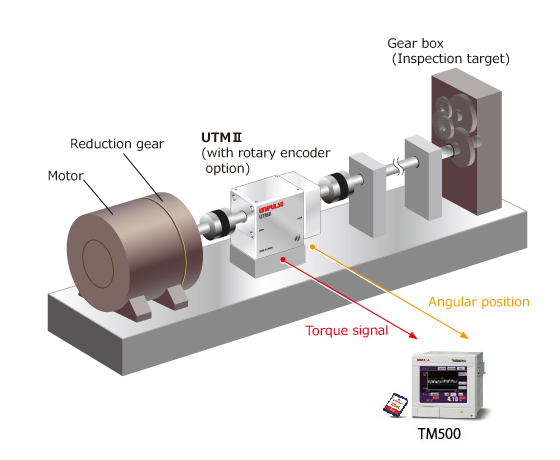 By connecting UTMⅡ with the rotary encoder option, the relationship between torque and angle (or displacement/distance) change can be displayed in a graph (waveform), which in turn, is used for thorough waveform comparison. There are two modes for waveform comparison useful for various purposes: “continuous” and “average” mode. In “continuous mode,” HI and/or LO control outputs will be turned ON when the sensor input level goes over or below the high/low limit for predetermined number of times. In “average mode,” a mean/average waveform data is calculated from a preset numbers of waveform data for OK/Not OK (NG) evaluation. All indicated values and all comparison waveforms can be saved and restored. Measured waveforms and judgment points can be saved automatically.